The Syrian regime’s torturing machine doesn’t distinguish between athletes, journalists, workers, artists as it threatens anyone who stands up against the Syrian regime. 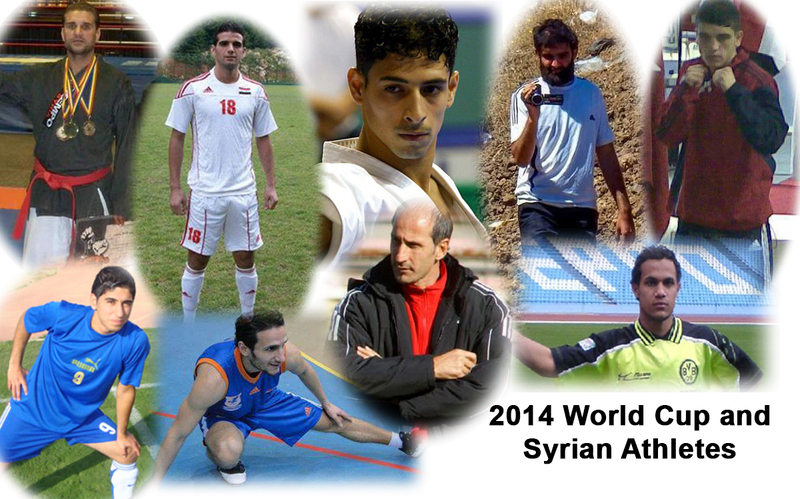 In light of the 2014 World Cup we are highlighting the suffering of the Syrian athletes. There are 34 athletes under arrest suffering from various methods of torture used inside the Syrian regime detention centers which caused disabilities for many of them and destroyed their athletic careers. Additionally, since the beginning of the Syrian revolution, six athletes have died under torture inside the detention centers while the rest were arbitrary trialed as some of them were sentenced to 15 years in prison like what happened to weightlifting champion Ayham Jomaa, 114 Syrian athletes were extrajudically killed, and 345 athletes at least had their limps amputated because of the indiscriminate shelling according to SNHR archive. For Syrian athletes, 2012 was the most brutal year as new Syrian athlete victims were documented almost every month. The first Syrian athlete victim was “Yaman Ibrahim” who was playing for Ash-Shurta SC and the Syrian youth national team, Yaman was killed on 22 April, 2012 in Damascus. SNHR documented the killing of 217 Syrian athletes using various ways ranging from live bullets to Scuda missiles, barrel bombs, and torture.